The Karlsruhe Institute of Technology (KIT) is a higher education and research organisation with about 10.000 employees, 25.000 students, and a total annual budget of about 750 million Euros. It bundles the missions of both precursory institutions: a university of the state of Baden-Württemberg with teaching and research tasks and a large-scale research institution of the Helmholtz Association conducting program-oriented provident research on behalf of the Federal Republic of Germany. Within these missions, KIT is operating along the three strategic Fields of action of research, teaching, and innovation. In establishing innovative research structures, KIT is pursuing joint strategies and visions. KIT is devoted to top research and excellent academic education as well as to being a prominent location of academic life, lifelong learning, comprehensive advanced training, exchange of know-how, and sustainable innovation culture. KIT’s research profile is characterized by a strong focus on information and communication technology, energy technology and mobility. It has significant competencies in the fields of optics and photonics, climate and environment, and the inter-relations of humans and technology. It hosts a significant number of infrastructures of federal or European importance. KIT builds on the extensive experience its predecessors have gained in EC-funded research from more than 1000 projects up to now. Swisslog is a global organization with 2,500 talented employees in more than 20 countries on four continents and customers in more than 50 countries. In December 2014 KUKA acquired all of Swisslog’s stocks making Swisslog a 100% part of its group of companies. Through Swisslog, KUKA can access particularly attractive growth markets such as warehouse logistics and the healthcare sector. Together, the companies form a global, full-service provider of automation solutions relying on the same competitive advantages: quality, innovation and technology. The two companies complement each other extremely well. Swisslog is headquartered in Buchs/Aarau, Switzerland, and is organized into two business units, Healthcare and Warehouse & Distribution Solutions (WDS). Swisslog WDS designs, develops and delivers best-in-class intralogistics automation solutions that enable forward-thinking customers to provide the right products, to the right place, at the right time. Swisslog delivers everything companies need to optimize logistics – from planning through implementation and customer service. Our order fulfillment and inventory solutions enable companies to achieve the highest throughput at the lowest cost, efficiently handle large catalogs of SKUs and accurately meet customers‘ delivery demands and specific requirements. 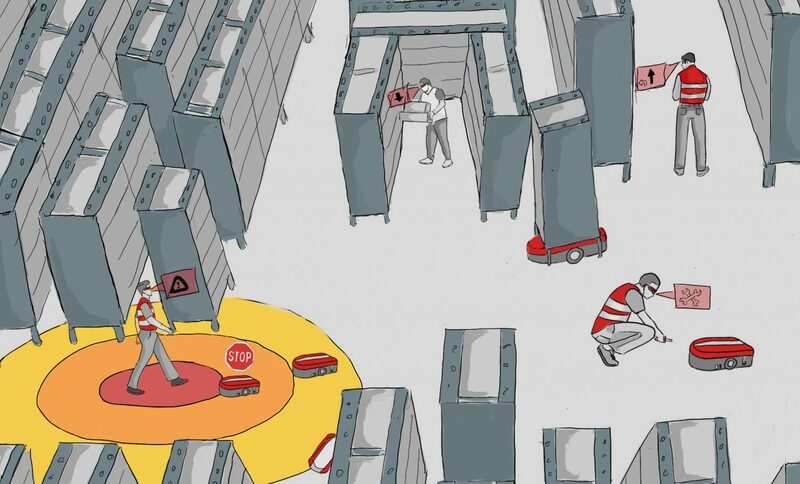 Swisslog’s product portfolio comprises amongst others Automated Guided Vehicles with a variety of vehicle types, which can operate as a standalone system or as part of a fully integrated sub-system. Swisslog’s conveyor systems are a modular design concept offering unique flexibility and unrivalled quality. The Pallet Stacker and Miniload Cranes are designed with maximum flexibility, energy-efficency and speed in mind. Software is one of Swisslog’s key competencies. Swisslog can offer a full suite of software and automation controls products for the management and control of distribution centers and warehouses whether they are manual or fully automated. Swisslog’s warehouse management system and controls software provide proven functionality and simple, user-friendly interfaces. The software is in use around the world at hundreds of sites. Last but not least Swisslog’s warehouse storage systems adapt to building structures to maximize storage space. Swisslog’s Storage Systems offer a variety of configurations to meet requirements. From small parts and single items to pallets, the systems make storage and retrieval more efficient. The CZECH TECHNICAL UNIVERSITY IN PRAGUE (CVUT), founded in 1707, is one of the oldest technical universities and currently the leading technical university in the Czech Republic with approx. 23000 students enrolled in engineering courses. With over 1700 members of academic staff is also one of the largest research institutions in the Czech Republic. The Czech Institute of Informatics, Robotics, and Cybernetics (CIIRC) is a new institute of CVUT founded in 2013 with the aim to concentrate an excellent research in the fields robotics, intelligent, distributed and complex systems, automatic control, computer-aided manufacturing, bioinformatics, biomedicine and assistive technologies. The key researchers of CIIRC have come from the Department of Cybernetics, Faculty of Electrical Engineering of CVUT, which is recognized as an outstanding research centre at the CVUT. In 2000 the department received the EU Centre of Excellence award and in 2006 the prestigious European IST Prize by the European Commission. The research focus covers the areas of intelligent mobile robotics, computer vision, artificial intelligence, biomedical engineering, and multi-agent systems. The UNIZG-FER is the highest-quality member of the University of Zagreb, with a large and modern infrastructure devoted to research-based education. With 170 professors, 220 graduate teaching and research assistants, 4.000 students enrolled in various programs, and operating in facilities of more than 40.000 m2, UNIZG-FER is the largest and leading educational technical and R&D institution in the fields of electrical and computer engineering and computer science in Croatia. UNIZG-FER is organised in 12 Departments which represent the focal points of education and R&D. The Autonomous Mobile Robotics (AMOR) group has a long tradition in research of advanced control strategies and estimation techniques and their application in autonomous navigation of ground and aerial robots in unknown and dynamic environments. AMOR group recently successfully organised two robotic conferences: (1) the 4th European Conference on Mobile Robots – ECMR’09 (www.ecmr09.fer.hr) and (2) the 10th IFAC Symposium on Robot Control – SYOROCO 2012. The Fraunhofer Institute for Material Flow and Logistics (IML) has been tackling logistic tasks, mainly the process, hardware and software development for internal and external logistics. The IML turnover consists of more than 50% of industrial contracts for software development in different logistical applications, supply chain consulting and R&D of novel logistical solutions. Knowledge acquired from funded projects is directly transferred in industrial contracts. So made-to-measure arranged teams create cross-industry and customer-specific solutions in the area of materials handling, warehouse management, supply chain management, simulation supported business and system planning and also traffic systems, closed loop economy, resources logistics, building logistics and e-business. IML is said to be first address for all questions with respect to holistic logistics, the employees work on all fields of internal and external logistics. At the Institute, founded in 1981, there are at the moment 200 employees as well as 250 post-graduates, supported by colleagues in workshops, laboratories and service areas. KONČAR – Electrical Engineering Institute is a leading Croatian industrial institute involved in R&D of equipment and technologies for efficient and reliable energy conversion and power transmission. As a result of a 50-year-tradition in applied R&D, KEEI has developed proprietary solutions for monitoring systems (transformers, electrical rotating machines, bay/switchyard, wind turbines), off-grid power supplies as well as platforms for design of demanding embedded HW/SW systems (including safety related SIL4 platforms). Currently there are 164 employees at KEEI, it is organized in 6 departments and its premises occupy 13.000 m2. In the frame of 6 departments there are specialised R&D sub-departments and 9 well-equipped laboratories which are used for R&D support, testing and diagnostics. In July 2014 KEEI became a Notified Body of the European Commission for several important EC directives (low voltage equipment, machinery, EMC, radio and telecommunications terminal equipment, appliances burning gaseous fuels, pressure equipment and personal protective equipment).